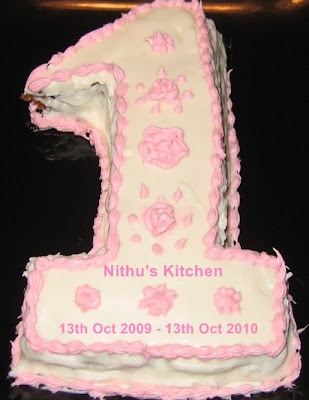 Nithu's Kitchen completes a year today with 300 posts and 221 friends through Google Friend Connect. Thank you friends for your support and encouragement. Hope, you all would continue to support me throughout this journey. My special thanks to my Hubby, Dad, Mom and Sister for their constant encouragement. On this special day, I would like to share few important happenings of Nithu's kitchen for the period of one year (13th Oct, 2009 - 13th Oct, 2010). 1. 100th Post on Feb 28, 2010 - This post was an event announcement to mark the completion of 100 posts. It took me nearly 4.5 months for 100 posts. 2. 150th Post on April 13, 2010 - This post marked 6 months completion of the blog. This was just a recollection of six months important happenings in Nithu's Kitchen. 3. 200th Post on June 4, 2010 - This post was an event announcement to mark the 200th post. 4. 250th Post on August 5, 2010 - This post was my first guest host event announcement. 1. 100th Post giveaway ($25) - Champa won the event for more number of entries. 3. UPrinting giveaway - Swapna was randomly selected from the comments left. 4. CSN Giveaway ($35) - Amritha Kalyani was randomly selected from the comments left. I started this Guest post series on March 8th,2010 to mark the International Women's Day. My sister kick started the series well. On Mothers Day, my Mom was the special guest. So far 30 guests (bloggers & non-bloggers) were introduced in this series. Thanks to all of you for your support. First time, I tried Food fiction for Aqua's event. Click here and here to read my food fictions. 1. Kadugu Sadam recipe featured in The Hindu, Metroplus on June 19, 2010. My blogger friends have passed me many awards as their token of love. Thanks to all of you for the awards. Click here to see the awards received. Congrats Nithu for the successful completion of one year of non stop blogging. Have a great 1st blog anniversary dear. Wow! That's really a lot what you have achieved. Congratulations congratulations!!!! Congrats Nithu on Blog anniversary.Wishing you many more to come. Congrats Nithu!! on the superb journey...may u have many more to come!! Congratulations on your achievement. Wish you many many more such milestones! congrats nithu for the first blog anniversary and the great achievements. Congrats Nithu dear...cake luks perfect...beautiful color combo!!! Congratulations dear Nithu! You rock girl! Congrats Nithu, happy blog anniversary and wishing u many beautiful things in this blogsphere..
Heart congratulations for your blog's anniversary Nithubala!! Hearty Congrats Nithu! What a wonderful journey you had in the last year! Best wishes for many more to come! Congrats Nithu...lovely cake..! keep rocking girl..! Congrats Nithu, happy blog anniversary and wishing u many beautiful things in this blog sphere..
congratulations..the icing looks fab nithu..and lovely achievements in less time..way to go gal ! Congratulations and best wishes on the first anniversary of ur blog. many congratulations to ur lovely blog. wishing u many more such milestones in this amazing world ! Congratulations on your 1st Blog Anniversary.Wish to see many more such wonderful years of anniversaries and thousands of posts. Congrats on our achievements and wish you many more. Congratulations on your 1st blog anniversary , Nithu..Wishing you many more! ஒரு வயசு குழந்தைக்கு வாழ்த்துக்கள்..இன்னும் தவழ்ந்து ,நடந்து ஓடியாடி விளையாட வாழ்த்துக்கள்...!! Congratulations and wish many more years for your wonderful blog. Congratulations Nithu..I was surfing net and saw your website ..good to see that you are updating your site time to time.I am a new comer to this blogging but not in cooking :). So lets see when I'll reach this milestone as yours.